Yes, fine, I'll admit that it didn't really work. But I'm leaving it anyway. JoeFor my last day in Istanbul, I still wasn't feeling the whole "crowd" vibe, so I opted to do something a little off the beaten track, namely to walk the land walls. 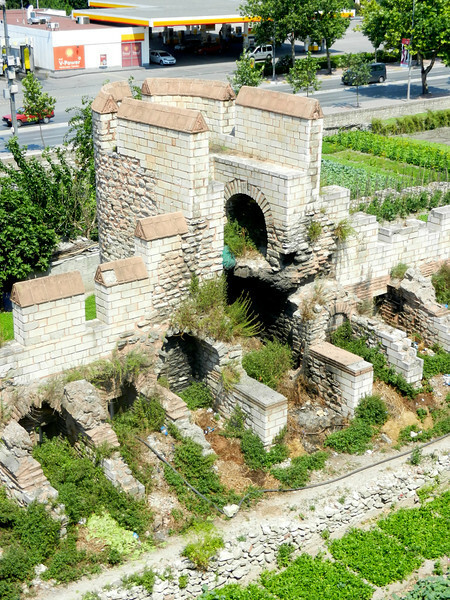 The Theodosian Walls, to be more precise: 6.5 km of double wall, completed in the early 5th century AD, and so ridiculously successful at protecting the city that they helped to keep Constantinople inviolate long after the power of the eastern empire had waned. 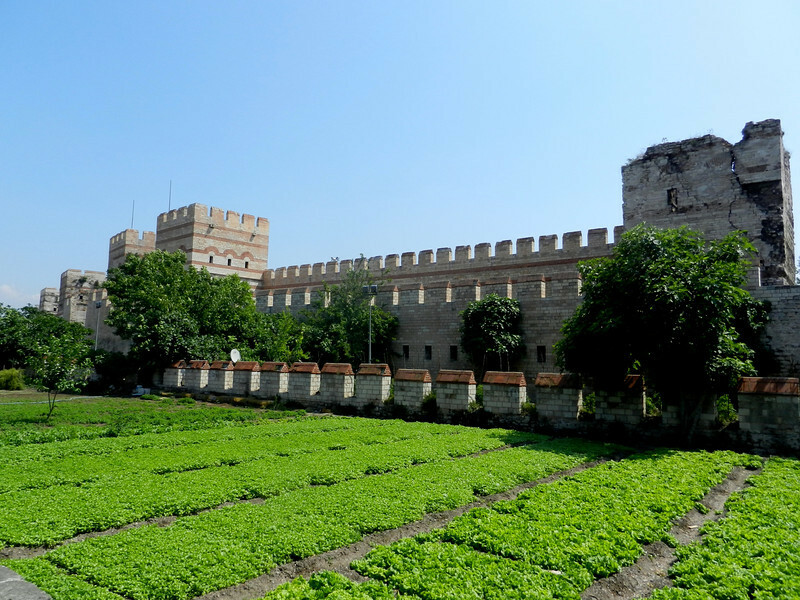 Indeed, the city was taken only twice in the thousand years that followed the completion of these walls (first when the Fourth Crusade sacked the city by breaking through the medieval replacement wall at the northern end by Blachernae Palace; second when Mehmed won the 15th century arms race by punching a great big hole in the middle of the wall with a cannon). Except for that northern section, the wall still stands in varying states of (dis)repair for most of its original length. I started the morning by taking the train to Yedikule Fortress by the Sea of Marmara. In Byzantine times, Yedikule was the Golden Gate, where Emperors would re-enter the city in triumph after a military victory; after the fall, it's where the body of the last emperor, Constantine XI, was displayed by the Ottomans (before he turned to stone and was absorbed by the tower, awaiting the day he would return to lead the Greeks to glory once again, of course). From there I walked north along decaying sections of wall, which serve now mostly to mark the path of one very long community garden. When possible I walked along the top, even though that meant I had to backtrack several times when the path came to an abrupt end; the rest of the time I walked along the front side, as the back is really just a narrow street, remarkable only for the evidence that several people still use the old defensive towers as nightly shelter. 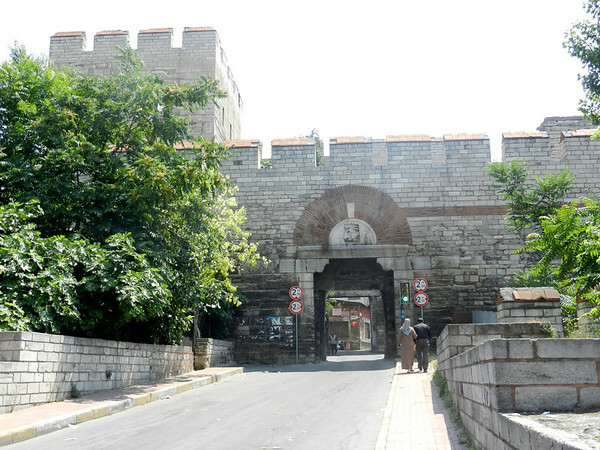 The wall cuts right through modern Istanbul, so along the southern half all of the surviving gates are now active (if narrow) roadways. 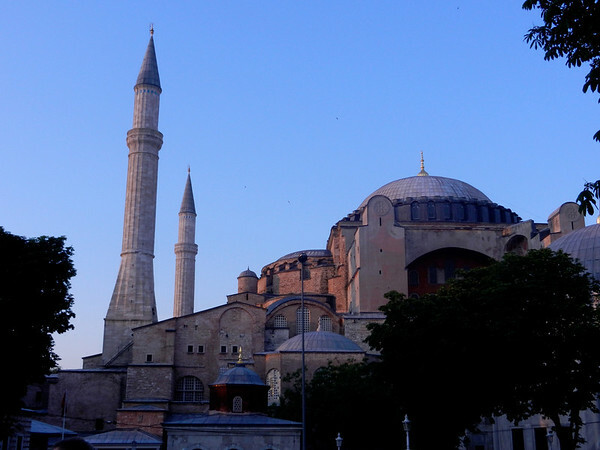 That includes the Gate of St. Romanus, where Constantine XI was last seen charging anonymously into a band of Ottoman soldiers, later to be presumed dead even though his body was never recovered. Also, the Adrianople Gate, where Mehmed made his own triumphal entry into the city (after Constantine XI had died defending the gate, naturally)1. Along the northern half, though, the gates have mostly given way to the demands of modern traffic management. The section the Ottomans destroyed taking the city has never been rebuilt; I actually expected there to be a plaque commemorating the day, at least, but in fact it's just a large, busy intersection. It took me to mid-afternoon to walk the whole thing, then another hour or so to manage public transport back to my hotel (including the most crowded tram ride of my life, incidentally). At that point I was pretty tired, but after a shower and a coffee I set out one last time as it was my last evening. No camera this time, owing to my destination, the Grand Bazaar. Istanbul is generally not known for pickpockets and bag-snatchers, but the Grand Bazaar is a notable exception, so I opted to travel as lightly as possible, just taking the few lira I had left and a couple of post cards that needed mailing. I stopped along the way at a köftecisi for an affordable, spicy dinner of köfte, bean salad, and a refreshing glass of ayram. Then I spent a couple of hours wandering through the bazaar, mostly just idly glancing at some of the 4000 stalls. I did stop twice to haggle, once to buy a small wooden backgammon set, and the second time to get a couple of shawls for Jennifer. I haggled for both, and I'm sure that I still over-payed for the backgammon set, but for the shawls I may have managed a decent price by virtue of simply not having any more money with me. Relatively pleased with my purchases, I headed home one last time, spending most of the 20 minute walk chatting with the young man who struck up a conversation when I was silly enough to stop at a crosswalk. He wanted to show me his family's craft shop, but alas I had to disappoint him, opting instead to go get some sleep before my ride to the airport arrived at 5 AM. 1 If you think the death of Constantine is confusing, try figuring out which of the prominently displayed swords alleged to be the one he wielded in defense of the city is real.